In line with environmental best practice we re-use our recovered timber before we recycle it. This enables us to manufacture bespoke pallets and packaging items from recovered timber to produce a ‘new life’ pallet. Modern machinery disassembles unwanted pallets to their component parts where they can be cut and reassembled to your specification. Totally free of any packaging obligation they may also offer a cost saving as well as reducing the burden of completing your Packaging Return obligation at the end of the year. We manufacture new UK standard 1200x1000mm, Euro 1200x800mm and bespoke wooden pallets and packing cases to your requirements. 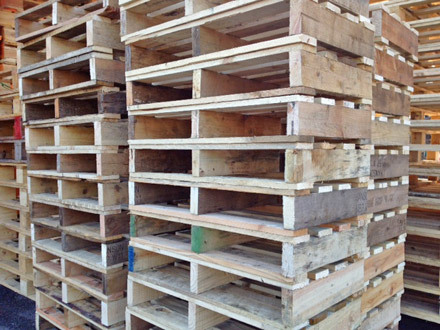 We stock a wide array of pallet types, including many grades of UK standard 1200x1000mm & Euro 1200x800mm wooden pallets. We can offer our customers ISPM15 heat treated pallets. We are accredited & licenced by the Forestry Commission. We currently reprocess on site the wooden packaging waste that we cannot use to manufacture 'New Life' pallets and turn it into Wood Chip.